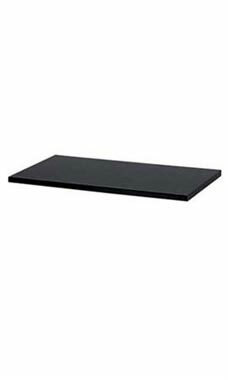 Add display space to your store with 48 x 12 inch Black Laminated Melamine Shelves. These shelves are prefect for displaying many types of merchandise. All 4 sides are edge-banded and the black melamine finish is sure to attract shoppers. Shelf dimension are 48” x 12” and 12” shelf brackets are also available. We received these twice. They were packed very well and they were a lot heavier than what I was expecting. They are very solid and durable! These shelves look beautiful in my store, but they do scratch easily. One of them came out the box already scratched up on one side but thankfully I was able to use the reverse side as the visible side. lightning fast shipping!! I had a little problem with minor damage and Store Supply Warehouse jumped right on it, I had new shelves within a day. I am so impressed with the customer service that I will always shop here first Thanks again SSW !